Blogging is tough when you’ve been sick! It’s even tougher if your content relies on applying makeup nearly every single day. Officially, the winter has already chewed me up and spit me out with my first winter cold! And I have to be truthful, I’m not entirely concerned with applying makeup when my nose is red from sneezing and my coughing even wakes my dog from deep snoozing. 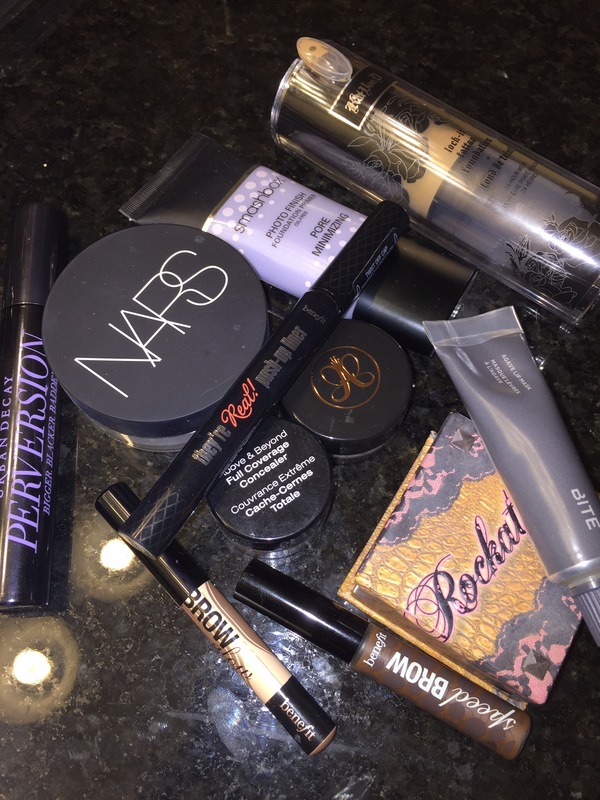 BUT, when I do start to feel like some semblance of a human again, I long to sit in front of my mirror and pull out a few products to make me feel pretty again (if not, at the very least, less like a walking tissue that smells of cherry cough syrup!) So how does someone who usually wears a full face of makeup deal with moments like this? Two words. Brows. Eyeliner. Next to a great smile, a great stare is part of any great face. Eyes are the first thing many people notice and you can even take YEARS off your look with a great set of brows and a nicely applied liner. Brows really open up the face and give you some shape that looks natural, yet straight off a runway! And eyeliner, especially in time of sickness, really opens up those eyes. 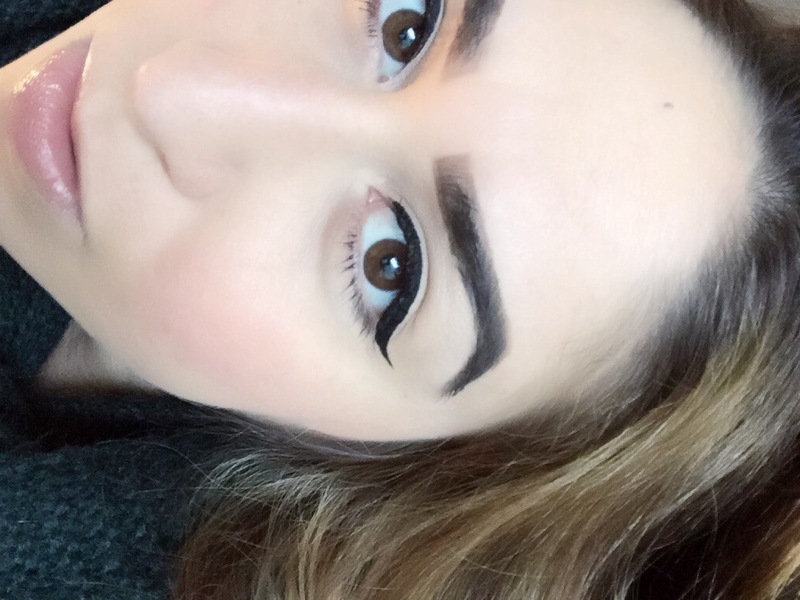 My go to eyeliner look is always a great cat eye, but it really is about finding what eyeliner application works best for you. A good rule of thumb to follow is top liner for small eyes (or any eyes for that matter) and bottom liner only if you need some extra depth. Bottom liner can often get smudgy and really minimize the eye if not applied correctly. Plus, if you are going for a five minute face, who has time to worry about mistakes?! I rarely apply bottom liner, unless it’s to the waterline or I’m smudging out some darker looks. My eyes are already large enough and bottom liner only makes them larger, and not in a good way. A few things to make sure you have, especially during the winter – a bulletproof lip balm for blustery weather and a long-wearing finishing powder. For this look, and for any look I do, I ALWAYS turn to Bite Beauty Agave Lip Mask in Clear. It’s thick, luscious, has a great shine, works as an excellent primer for other lip looks, and I’ve found that even when the wind blows my hair into the product my locks don’t get stuck! For a finishing or setting powder, I don’t know how I lived my life before without the Light Reflecting Loose Setting Powder by NARS. The product also comes in a pressed form, but I find that you can really monitor the amount of product being used much easier if the product is a loose dust. What’s great about this setting powder is that it actually LASTS all day and matte-ifies every skin tone no matter what the skin issues are going on! I have semi-dry skin and it’s the first setting powder to mask that instead of bring out the dryness more. What’s more is that I notice the powder even makes contours and blushes stand out more vibrantly. Avoiding the washed out look is a tough task in the winter, and this product certainly helps with that! Urban Decay’s Perversion Mascara: Soft formula with literally NO cake factor, a big brush, and a jet black sheen. Great for natural lashes or even falsies. Smashbox’s Photo Finish Foundation Primer: Primer. You need it. No way around it. Especially in winter. No one likes visible pores right? Good, because neither does Smashbox. Kat Von D’s Lock It Tattoo Foundation: There is no foundation like this. NONE. However, if you are not accustomed to full coverage foundation, this might be a bit of a shocker when first applied. But if you do the research and get the right shade (she has TONS) then you will never go back to any other foundation. It’s that amazing. Benefit Cosmetics: Benefit has some of the most effective and user-friendly products out there. No brow look is complete without some of these products, and pictured here is Hi Brow Glow for a lift to your brow arch, Speed Brow to set the brow look with some tinted gel, and They’re Real Push-Up Liner which is the coolest (but requiring a learning curve) product you will ever see on the market (so far that is.) Essentially, it’s a gel liner in pen form which is SUPER convenient! But, the angled tip of the liner and formula itself require some test runs before you can become an expert. But really, isn’t that ANY eyeliner? Highly worth it, and I recommend giving it a try! And let’s not forget Rockateur which is a perfect blush shade for any season. In a fast look for winter, it’s more about the rosiness of the cheeks and not so much the contour of them. NYX Cosmetics’ Above & Beyond Full Coverage Concealer: Not just a great product for under-eye circles, but the coverage makes an exceptional candidate for a cream highlight if you want to contour as well! Plus, everyone loves a great product at a great price! Anastasia of Beverly Hills’ Dip Brow: Your brow game will thank you for this little guy! If you haven’t tried this cream-based delight for your brows, it’s a must! Again, TONS of shades to choose from but once you find yours, your angled liner brush will thank you! While a natural face does not feel natural for me in the slightest, it’s good to know there are products out there that can help you rock that no-makeup look in five minutes, but still leave you with the feeling of being pampered and primped. Who needs cold medicine when you have makeup, right? Okay, maybe not…but almost.